Ferrari turns 70 this year, which is a pretty major milestone. Seventy years of racing and producing some of the most beautiful road cars ever to grace the earth. What is a better way to celebrate this than to throw a big celebration in the City That Hates Cars, then? 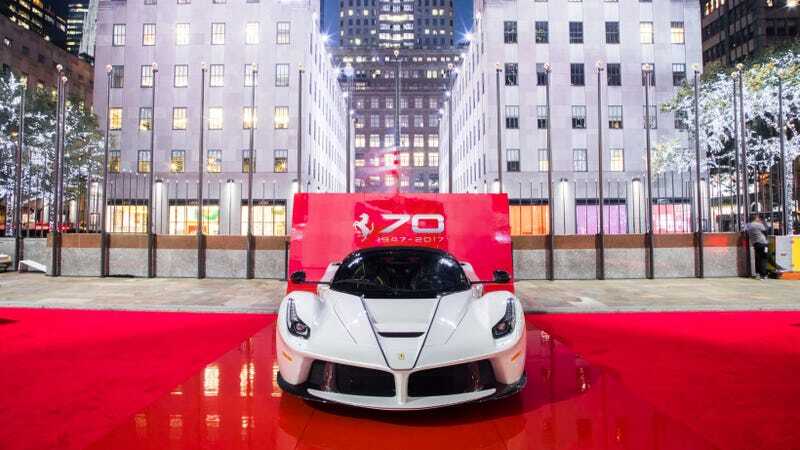 “Through The Decades”—Rockefeller Plaza will host an open-air exhibition displaying one extraordinary car per decade, as well as the limited edition LaFerrari Aperta (30 Rockefeller Plaza between 49th to 50th Streets and 5th and 6th Avenues). “Motorsport And Performance”—Hublot Flagship Store to have a store-front exhibition on Fifth Avenue of iconic racing cars, past and present (Hublot, 743 Fifth Avenue at 57th Street). “Ferrari Today”—Ferrari New York Showroom with front-engine V12s in the spotlight. 10 a.m. to 5 p.m. in the showroom (410 Park Avenue at 55th Street). “Iconic Ferrari”—RM Sotheby’s, where you can see supercars and priceless models across the decades. 10 a.m. to 5 p.m. in the 10th floor gallery (Sotheby’s, 1334 York Avenue at 71st Street). And there are prizes, too! Visitors can explore the collection of Ferrari vehicles across the display locations and learn each model’s story. By sharing images and experiences on social media a chance to win is earned for one of 70 quintessential Ferrari experiences ranging from Ferrari F1 Paddock Club passes, to being a Ferrari team insider at the 24 hours in Daytona, to a live test drive of one of our latest road cars. You can expect to see a 166 MM, 250 GT Tour de France, 400 SuperAmerica, 250 GT Lusso, 250 LM, 275 GTB, 308 GTB, 512 BBLM, Enzo, 812 Superfast, F12tdf and a 70th Anniversary Edition F12. If you’re in the NYC area and want to see some ‘Raris, then you should go check it out. Win something! What Happened To The Ferrari 550 Maranello?